EDIT: Giveaway is officially over. Congratulations to Cristina Popescu for submitting the randomly-chosen 732nd entry. The weather is heating up and that means fun trips to the pool and beach to cool down! Nourish your skin after a day in the sun by washing away the chlorine or sand with all natural bath products. 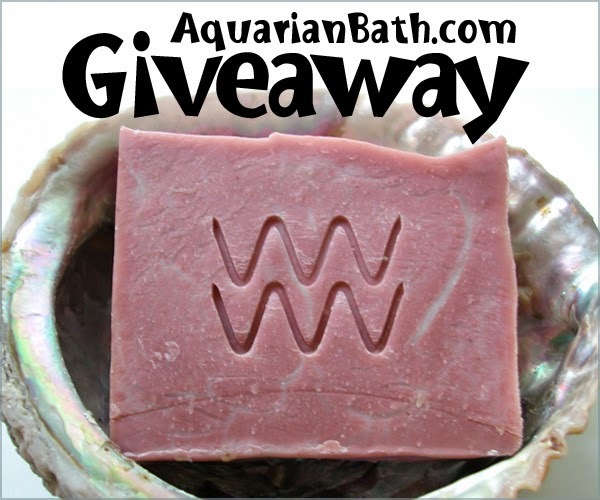 Cory of Aquarian Bath is giving away three bars of soap to celebrate summer. The handmade soap prize pack includes lavender oatmeal gentle soap, lavender rose soap and tea tree soap. Aquarian Bath, a family-owned company in Daytona Beach, strives to be as green as possible - their website even runs on just 3 watts of solar power. Their splendid soaps are handmade from natural ingredients that include herbs, colored clays and mineral pigments. They don't use GMO oils in any of their products, which range from deodorant balm to flaxseed pillows to tooth powder. Cory has a background in Biological Sciences from the University of Washington and studied herbal medicine at the Northwest Institute of Acupuncture and Oriental Medicine. She's definitely earned the title "herbalist extraordinaire!" Use the Rafflecopter below to enter to win worldwide giveaway before 11:59pm EST on June 20, 2014. Be sure to leave the mandatory comment on the blog post with the same name you use to fill out the Rafflecopter - all entries by winner must be easily verified or a new winner will be chosen. Not including usernames when asked will also get you disqualified. My favorite item is the Castile Soap. Would love to try the Tea Tree Deodorant Balm. Lavender oatmeal soap sounds great. I like the Gift Set Soap, Shampoo Bar, Lip Balm, 2 Cedar Soap Decks. I liked a lot but the herbal pain and inflammation spray would be perfect for me! Mix and Match Bath and Body Set by Aquarian Bath is my favorite. Thanks for the giveaway. There is no end to the amount of lovely soaps in that store, I think because of my habits, the gardeners soap would be the best choice for me. I like the Orange Vanilla Dreamsicle soap. #1 DAD Soap or Shampoo Bar with Hemp-Organic Cotton Washcloth is my favorite. Thanks for the opportunity. I love the Tea Tree Deodorant Balm. I can't decide between the key lime eucalyptus bar or the detox and clarifying soap set! Lovely soaps. The Lavender Oatmeal Gentle Soap sound intriguing as I have sensitive skin. Love all the products! My fave is the Hemp Soap and Shampoo Bar Gift Set by Aquarian Bath.Beautiful products! Mandarin Patchouli Botanical Perfume looks nice. J' aime le " carrot top shampoo bar vegan " c' est original, on est tellement habitué au shampoo liquide en bouteille. Hi! Cool shop! Another item I really like is their Hemp and Organic Cotton Washcloths with the Turquoise trim. Nice! (entered name: Natalie Brown email: natorama99@yahoo.com) Thanks! I love the #1 DAD Bath and Body Set by Aquarian Bath set. Way too cute. I think my husband would like it. I like the Orange Clove Soap by Aquarian Bath. The two flavors must smell great together, like holidays. I love, love, LOVE their unscented castile soap. It's great for uber sensitive skin. I also would love to try their washcloths. My favorite item: "Thanks, teacher!" Hand Stamped Soap Lavender Oatmeal. I like the tea tree deodorant! I love the Aquarian Bath Shampoo Bar Set of 3 or set of 6! I love the idea of the Gardener's Soap. Perfect for me - and my green fingered dad! I like the Orange Clove soap! Love her soaps! But would also love to try her tooth powder and deo. Love all the beautifull products! My fave is the Hemp Soap and Shampoo Bar Gift Set by Aquarian Bath. I like the gardening soap gift set. The chocolate and cocoa butter lip balm looks great! my favorite item is the carrot top shampoo vegan bar! I love the Organic Cotton Flaxseed Neck Wrap with Organic Herbs. It's great! My favorite item is the #1 DAD Soap or Shampoo Bar with Hemp-Organic Cotton Washcloth! Love to try the Root Beer soap! I like Chocolate and Cocoa Butter Lip Balm. I like the black drawing salve best. I know It's something I will use a lot. The Deodorant Balm sounds amazing! I think my favorite would be the Detox and Clarifying Soap Set, I have been reading a lot about charcoal and bentonite clay so I'd love to try it out! Love the look of the Mix and Match Bath and Body Set. Jasmine Rose perfume! Thank you! I like the Detox and Clarifying Soap Set - Skin Polishing Soap Set. I love the Tooth Powder Black Licorice Toothpaste, Organic Cotton Flaxseed Neck Wrap with Organic Herbs, Frankincense and Myrrh Solid Perfume and the Lavender Rose Botanical Roll on Perfume. Wow.... had to make myself stop looking around. Love these products. I would love to try the Lavender Cedarwood Deodorant Balm. I would love to get the Ocean Waves Sea Salt Soap. My favorite is the Black Charcoal & Bentonite Clay Black Magic Clarifying Soap. I would like the bath & body gift set. I have been dying to try the Neem Oil Shampoo Bar. I love Aquarian Bath Products. I like to try the Crouching Tiger Hidden Dragon Balm. Skin Regeneration Balm sounds excellent. I like the Lucky Fisherman's Anise Soap. I like the Star Anise Olive Oil Soap! I would love to try the key lime eucalyptus soap! I love the Mix and Match Bath and Body Set by Aquarian Bath. I would like the Lavender Sweet Orange Lip Balm. Jasmine Rose soap for SURE. I love taking baths, and the flex seed neck wrap looks like a great addition to my routine. The Jasmine Rose soap because rose scented soaps always remind me of sleep overs at my grandmother's house. She had the best smelling rose soap! I would love to try the Skin Regeneration Balm. I like the Castile Soap. SOS. Help. Pick me, pick me! Your next winner!!! Show me the money!!! It would be a dream come true & means more to me than anyone else to win. :( Starving artist here desperately needs the soap to wash, to have fun, feel alive & inspired again. A life changing experience. Top of my bucket list. Thanks for the awesomeness, the contest, & generosity. Dear Santa: I’ve been nice. My X-Mas wish this year is to win this contest! Tea Tree Deodorant Balm sounds quite useful for this summer time! But I'm also into the lovely I Heart Mom - Soap and Massage Oil Gift Set! I like the Organic Cotton Sateen Yoga Eye Pillow. I like the Tooth Powder Black Licorice Toothpaste Alternative, it sounds really neat. Would love to try the Skin Regeneration Balm !! I would like to try the "Tea Tree Deoderant Balm." I like the Gift Set Soap with a shampoo bar, lip balm, and two cedar soap decks. Any of the neck wraps are absolutely awesome! I would love to try the unscented Castile Soap because I have sensitive skin. I like the Key Lime Salt Soap but they all sound wonderful. I like the Organic Cotton Flaxseed Neck Wrap with Organic Herbs by Aquarian Bath. I really like your Mix and Match Bath and Body Set by Aquarian Bath! Bailey Dexter I really like the Organic Cotton Flaxseed Neck Wrap with Organic Herbs by Aquarian. What a great product to just down and relax after work with! I would love to try the Carrot Top Shampoo Bar Vegan! i like to try the castile soap. I would love to try the Skin Regeneration Balm 2 oz. I really like the Mix and Match Bath and Body Set by Aquarian Bath! The Organic Cotton and Hemp Flax Seed Neck Pillow with Organic herbs with pillow cover - Pink AND the Stamped Lavender Oatmeal Soap seem like perfect items for me! I grew up using different types of neck pillows like those, some with cherry pits or mixed herbs, and they are fantastic! Thanks for the giveaway! I love the Carrot Top Shampoo Bar Vegan! The black licorice toothpaste peaks my curiosity. Would love to try that. I like the Jasmine Rose soap. I would love to try out their Organic Cotton Flaxseed Neck Wrap with Organic Herbs by Aquarian Bath - green. Thanks for the giveaway…we like the Tea Tree Soap ! I revecied my prize, thank you very much, the soaps smells very good.